I’m Kit Lang of the rather predictably named Kit Lang Fiber Art, living in a mercurical and funky neighbourhood in Toronto, Ontario, called Leslieville. I started out calling myself a quilter, and then became an art quilter, and then became a fiber artist and now, as I combine fiber and quilting with paint and charcoal and encaustic and resin… I don’t know – but it always starts with textile. Which I totally blame on my mother! I am about to turn 50 and grew up with a mother who was nearly 50 when I arrived, so she was Old School (note the capital letters.) She stayed at home and cooked and baked and sewed. She sewed clothes for all of us kids and herself, and made curtains and cushions and slipcovers and pet beds and tote bags and satin purses and felt hats and rag rugs and placemats; (pause for breath) and she cross-stitched and knitted and crocheted and tatted and embroidered and I knew she’d crossed to the dark side when I was 11 and she became a diploma-ed pattern maker. And so I grew up with her bits of fabric all around me and was always encouraged to sew all kinds of things – she even taught me some basic pattern making so I could make clothes for my dolls. So I’ve been sewing one thing or another my whole life. But strangely, she didn’t quilt; so I didn’t either. But my Oma and my Tantes quilted, so quilts were all around me. And because of that, from an early age, I got into the habit of saving my bits of fabric in like coloured bags, and then boxes, and then bins, and then boxes of bins! And by the time I was 46 I had a wall full of bits of fabric in boxes labelled “green”, “pink”, “soft green”, etc. and my Beloved Spouse (“BSP”) said “What are you saving those for?” and I said “I’m going to make a quilt” and BSP said “Well, make one already!” So I did. And I fell into the rabbit hole. I didn’t have a pattern or a rotary cutter or any idea of the importance of a ¼ inch seam, and since the quilts I grew up with were tied, I didn’t know that your feed dogs needed to be down when you free motion quilted: so that first quilt was a mess! But I thought it was the most beautiful thing in the world and I knew I had to make more. 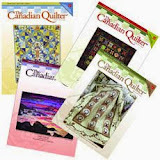 So I bought every quilting magazine I could find, and went on the internet and googled “quilts” and found out that there were approximately eleventy billion quilting blogs out there – so I promptly started making and blogging. 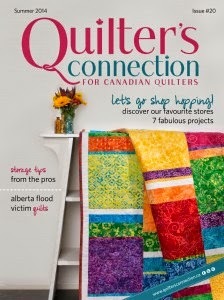 I don’t know how BSP and my children survived that first year, because in that first year I made 36 quilts. Fifteen of them queen sized. And I was NOT a stay-at-home mom. But I was consumed with the quilts that I saw in my head and wanted to be GOOD enough to make them; and I knew the only way I could do that was by making them. In 2009, I accidentally made an art quilt. 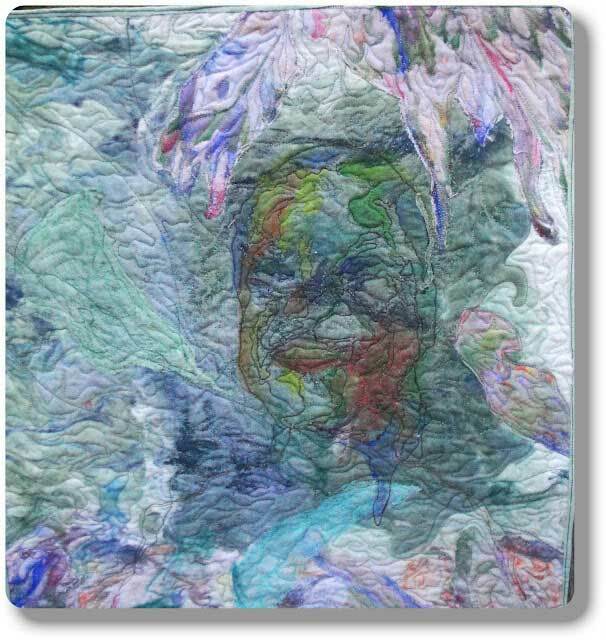 I say accidentally, because I dreamed that I made one, and the next morning, I got up and followed the instructions from my dream self – and by 12 hours later, I had myself an art quilt. 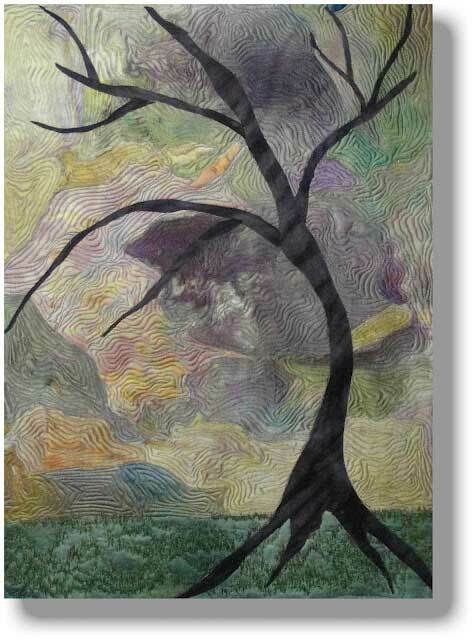 I was a reluctant art quilter though – I thought art quilters were a rareified breed of elite quilters who were in a kind of semi-secret society that clearly, I had no part in; and I thought they were kind of snobby and I didn’t think I liked them. LOL! So I went back to my quilting and concentrated on that, but I would occasionally think about other art quilts I’d like to make and finally, in 2010 I did. And then I went though a whole thing where I was trying to “choose” between art quilts and bed quilts and finally figured out that I didn’t have to; and then I went through another thing where I realized that when I finally learned how to make the art quilts I saw in my head, that they wouldn’t strictly be art “quilts” anymore so if I wasn’t an art quilter, what was I? 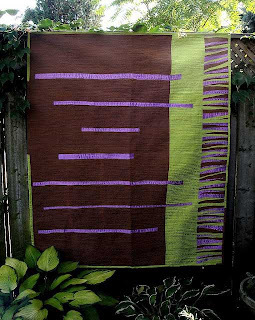 So I started calling myself a textile artist – and here we are at the beginning of this introduction again! 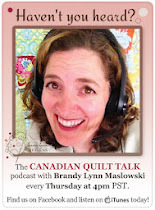 Now I don’t really call myself anything – I just make quilts and art and other stuff – and whatever the stuff I make is, there’s always a needle in there somewhere. In the past year, my biggest accomplishments were things that might seem small to other people. My only goal for 2011 was to learn the skills I needed, to make the art I wanted to make - and I did! Honing the ones I have and learning more will always be part of what propels me forward in my art, but that was truly my biggest accomplishment of 2011. An indication of that growth was that in 2011, I was asked to be a contributing member of a surface design blog that I had been following called And Then We Set It On Fire; and I was also asked to exhibit a quilt I’d made in 2011 at a quilt show in Europe this year. 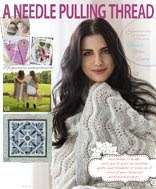 I’m supposed to finish up by telling you what my biggest dream for myself is, but it’s one I hold gently to my heart, so I’ll share with you my second biggest dream – I want one of my works – whether a quilt or an art piece – to be juried into the International Quilt Festival in 2013. Stay tuned! And thanks for having me. 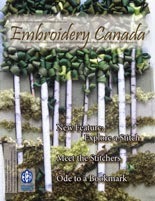 If you’d like to see more of my work, please come by my blog, Kit Lang Fiber Art.